Ants are the horned lizard’s main source of food. However, if you eat one ant, you’re declaring war on a whole colony. Ants start biting you and swarm all over you. So, the horned lizard has developed a special defense against these ants- a wall. It’s skin is filled with scales and spikes that are so hard and strong that ant’s mandibles cannot pierce it. That means that the ants are the ones that are helpless. After all, 0 multiplied by 5 trillion times is still zero! Another defense that these reptiles have is camouflage. This is a common defense- if you can’t find something, you can’t catch or eat it. It’s like trying to find something that doesn’t exist! 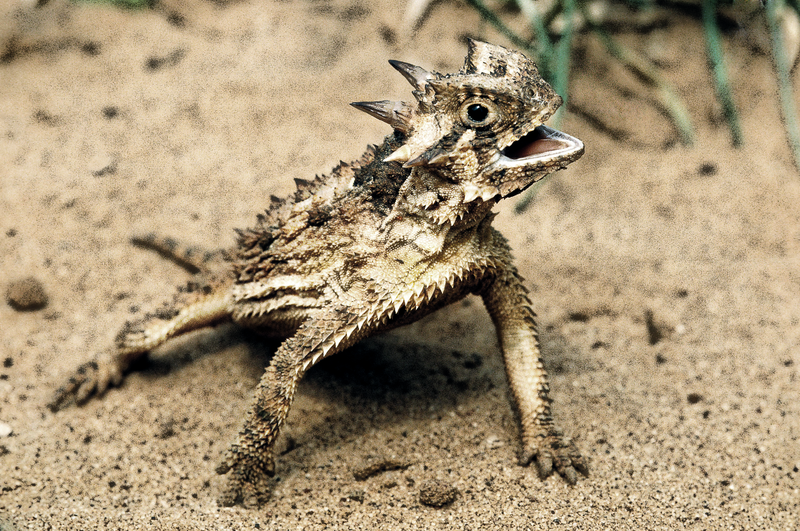 The horned lizard can hide in its desert surroundings. If it spies a predator, it immediately stops moving and blends into the desert landscape. The coyote, the main predator of the horned lizard, if cannot find prey, cannot eat prey. Just don’t be found, and you won’t be eaten! The horned lizard’s blood is not venomous but it still keeps the lizard safe. The blood has two ways of doing so. Both help each other be more effective. The first way is that it sprays blood from it’s eyes. It can shoot up to 5 feet far, and can easily hit a coyote! The second defense hidden within the horned lizard is that the blood has a canine-repelling substance. What a way to send them packing?! If really agitated, the horned lizard will puff out like… a pufferfish. The body expands and makes it harder to swallow- and it hurts! With spikes and the puff, It sure is enough to send me leaving, even without the gruesome blood, for it would be fruitless and a waste of time to even try. With spikes and scales, this lizard would be one hard thing to chew. This doubles, if not triples, the effect of puffing up. Snakes and birds can do nothing to this ingenious product of nature- if they bite it, they might as well bite a ball of nails. This works like a hedgehog-no predator will eat a spike-ball, or a spiked lizard.